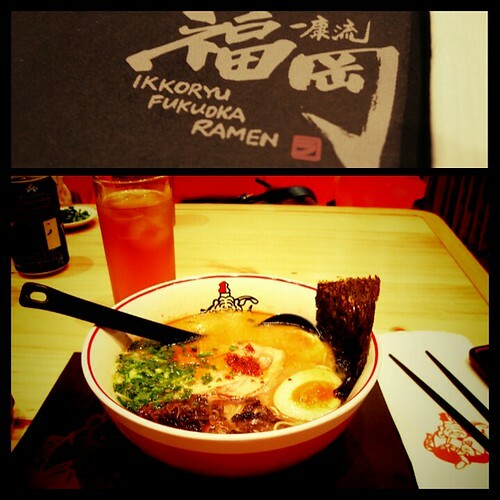 One if the shops I visited is Ikkoryu Fukuoka Ramen, at the 5th gloor of Shangri-la Mall’s new East Wing. It seems to be a part of a noodle franchise from Japan, but one that specializes particularly in thin noodles. The store prides itself with it’s Hakata-style tonkotsu ramen which is a nice luxurious broth made from pork bones and has thin noodles. I went here with my friend Yue and her sister after a harrowing morning lining up to get comics. The lines weren’t insane when we arrived roughly around 11 a.m. but as soon as we came in, a line started to grow. I think that’s just a result of the Ramen boom. Everyone’s excited to figure out which ramen tastes best. I myself am here to figure out which is my favorite ramen. And I’ve visited a few prior to Ikkoryu and I’ve tasted a few in Japan. So my standards are particularly high, especially to those who claim themselves as ‘authentic’. When my friends and I sat down and the wait staff started to get our orders, they asked something that other noodle restaurants have never asked me, “How do you want your noodles to be cooked?” We were surprised as we never thought it was ever an option before, but in case you guys come here and they ask you this question, the answer range from soft, chewy, or hard. Well that’s the closest I can get with the English translation. Hard is something close to al dente, soft is how Filipinos usually love their spaghetti, and chewy is something in between. Because the noodle is thin, I suggest getting a hard noodle because soft noodles won’t have enough grit to take the flavors of the broth when you slurp it. It’s almost like misua, not that I’m saying misua’s bad, but personally, I prefer having texture in my noodles. 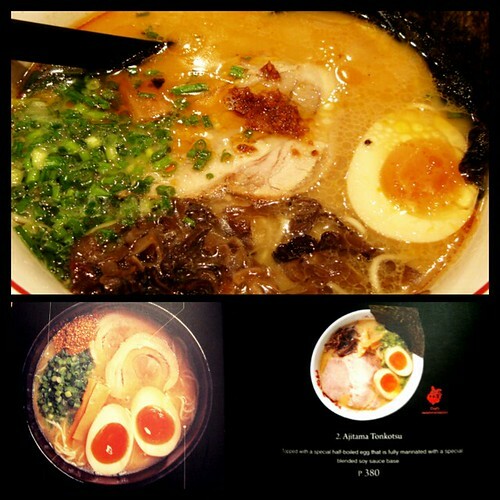 It has a small selection of ramen, ranging from tonkotsu, a special, a black garlic ramen, and a spicy option. I think they have a miso as well. Price ranges between PHP 350-500 which is reasonable, given it’s serving. It also has options for those who don’t want to eat ramen or would like to have accompaniments with their ramen. And I didn’t bother with that, really. Sorry. I… how can I not eat ramen in a ramen bar? OTL. I got the Ajitama tonkotsu because… it has eggs. I’m weak to softboiled flavored eggs, okay! If anything, I always look forward to those yummy eggs! In terms of content, unlike most ramen places, Ikkoryu Ramen has more toppings like spring onions, beni shouga (pickled ginger, at the side), menma (pickled bamboo shoots), and if I’m not mistaken some mushrooms ears which I really love. Compared to my experience with Ippudo, Ikkoryu’s Ajitama tonkotsu’s got a heap of toppings. However like Ippudo, they manage to make a really good broth that’s not too heavy or greasy. In fact, I enjoyed how the flavor lingered in my mouth, even when I slept. YES! It’s worth not brushing your teeth for! They also have the black garlic tonkotsu which I didn’t try as I’ve had my trauma with restaurants in Manila trying hard to balance the ‘blackened’ sesame taste. Either way, for a hungry woman, Ikkoryu’s Ramen delivered. Right now, I’m not gonna care if it’s authentic or not but if it made me break my dental hygiene to relish a moment, then I’m good. That looks really appetizing. I’m gonna give this one a try sometime!